“Every gift of human life is sacred, from conception to natural death, and the life and dignity of every person must be respected and protected at every stage and in every condition,” the cardinal said in a statement April 12, the day Democratic Gov. Phil Murphy signed the Medical Aid in Dying for the Terminally Ill Act, effective Aug. 1. “Those whose lives are diminished or weakened deserve special respect. 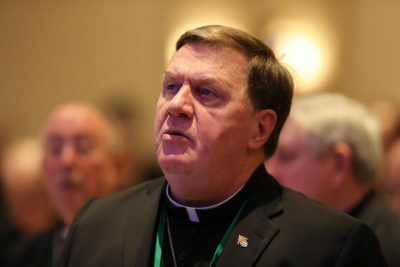 Sick or disabled persons should be helped to lead lives as normal as possible,” Cardinal Tobin said. Under the new law, which goes against the Catholic Church’s fundamental teaching on the sanctity of all human life, adults who receive a terminal diagnosis would be allowed to obtain self-administered medication to end their lives. Murphy is Catholic. It passed the Assembly 41-33 and the Senate 21-16 March 25. As the measure awaited Murphy’s signature, pro-life groups and other opponents urged state residents to contact the governor and ask him not to sign the bill into law. One of the opponents of the measure who testified at the Statehouse March 25, Dawn Teresa Parkot, who did not mince words when speaking about the Aid in Dying bill. “I firmly believe that assisted suicide is homicide and those who assist, regardless of their intentions, are guilty of taking a life just as surely as if they participated in a state-sanctioned execution,” said Parkot, a quadriplegic motivational speaker with athetoid cerebral palsy. She uses a computer-based communication system to speak.